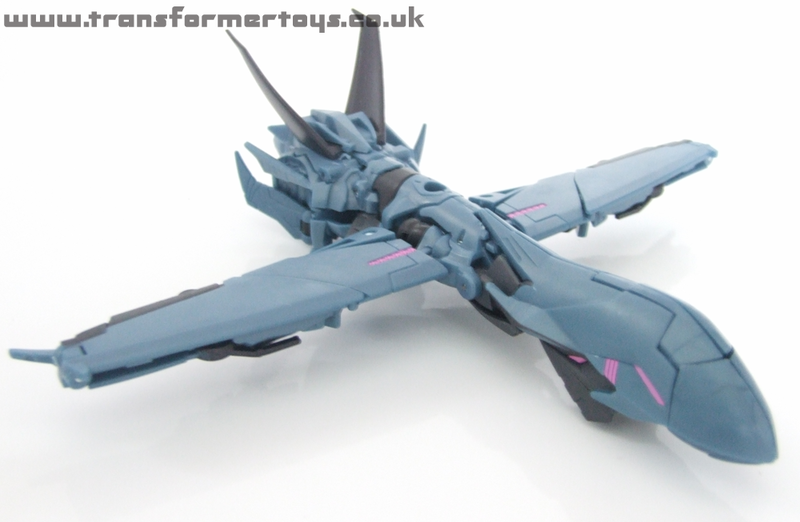 Welcome to the toy review, image gallery and information page for Transformers Prime Soundwave . 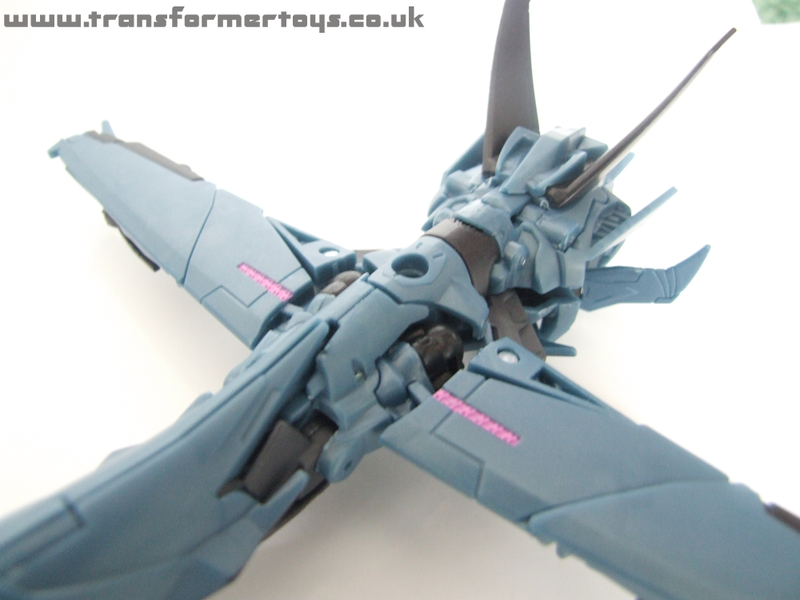 The following tags have been associated with this Transformers Prime Soundwave gallery. 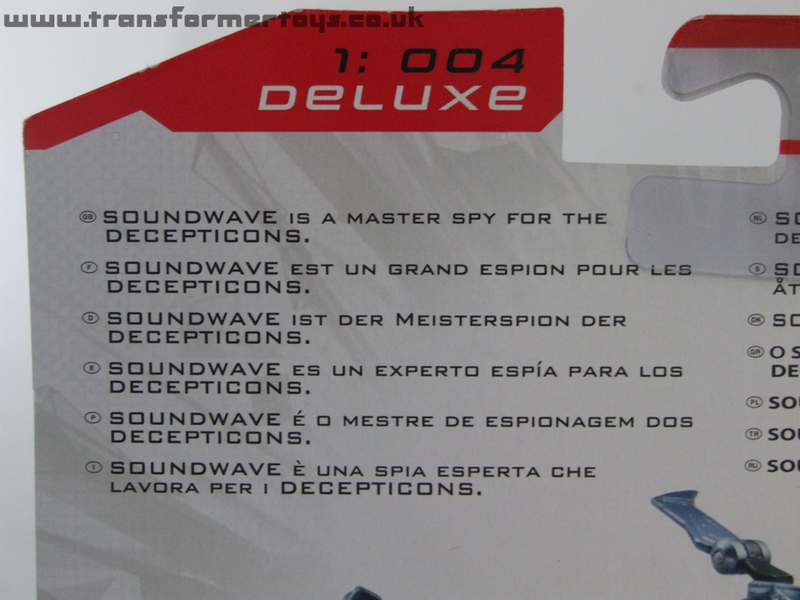 Soundwave is the communication officer and master spy for Megatron , for whom he is extremely loyal as he was Megatronus' first follower. 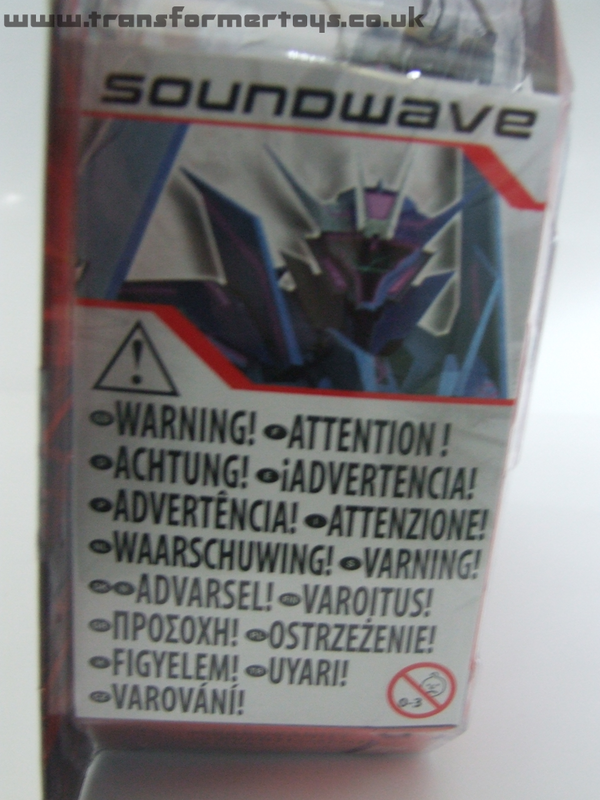 In the Transformers Prime television series Soundwave does not speak other than playing back recordings or transmissions that he has intercepted. 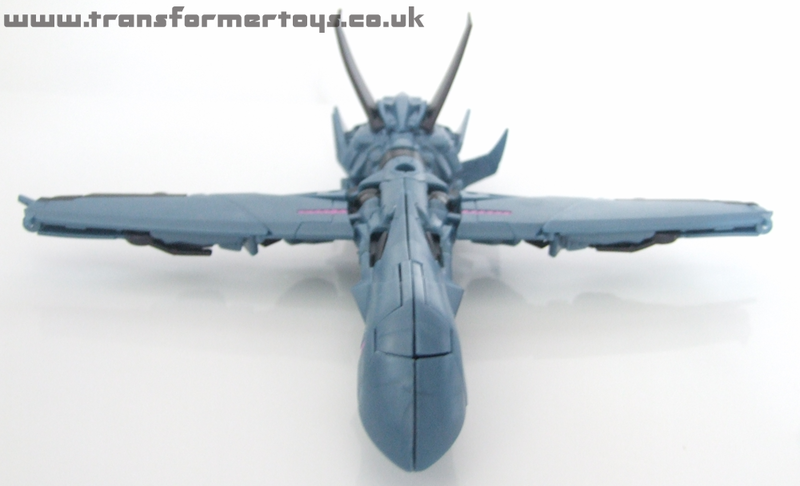 During the first season of the show, he is mainly found onboard the Decepticon cruiser though occassionally he is seen leading the aerial Vehicons into battle. 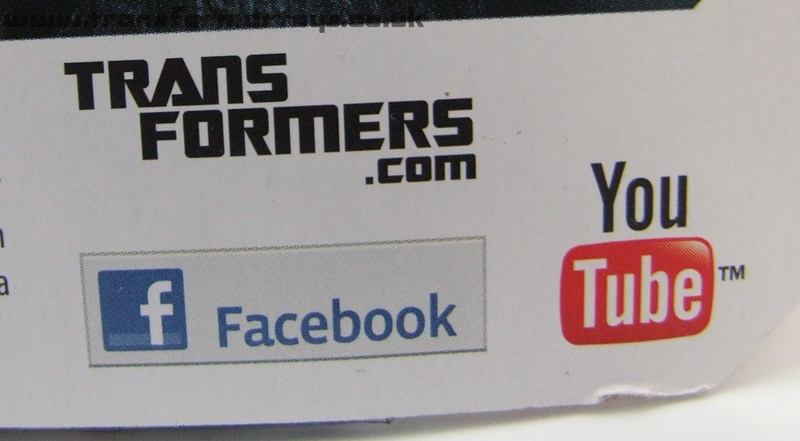 We picked up the Soundwave toy from a near-by Argos store on the 21st January 2012 for "12.99. His box number is 1:004. 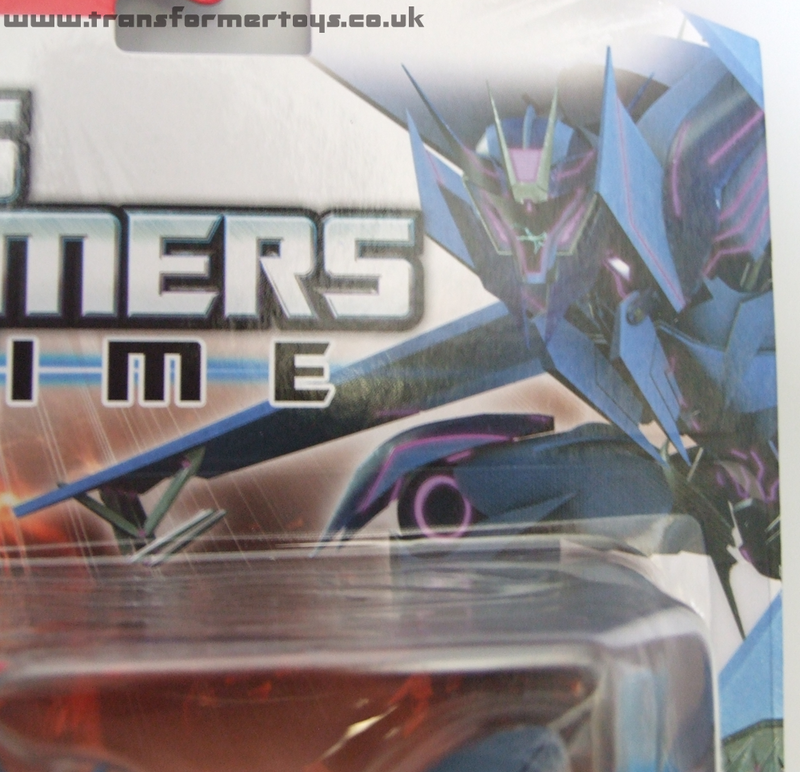 The first thing that I noticed about the Soundwave figure compared to the other Transformers Prime toys that I own was that the quality of the plastic looked a lot better to the naked eye. This is mainly due to fact that he is made from a darker plastic compared to Bumblebee and Cliffjumper, the other figures I picked up at the same time. 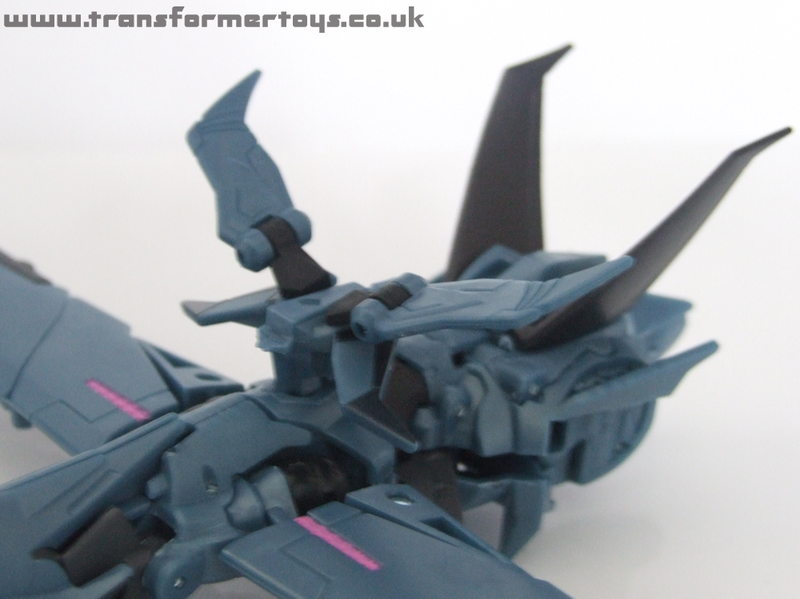 Soundwave is very well sculpted, he's very smooth with a great head sculpt that still resembles the Decepticon insignia. His face, which is an entire faceplate, reminds me of the Cobra Viper and B.A.T toys from G.I Joe. 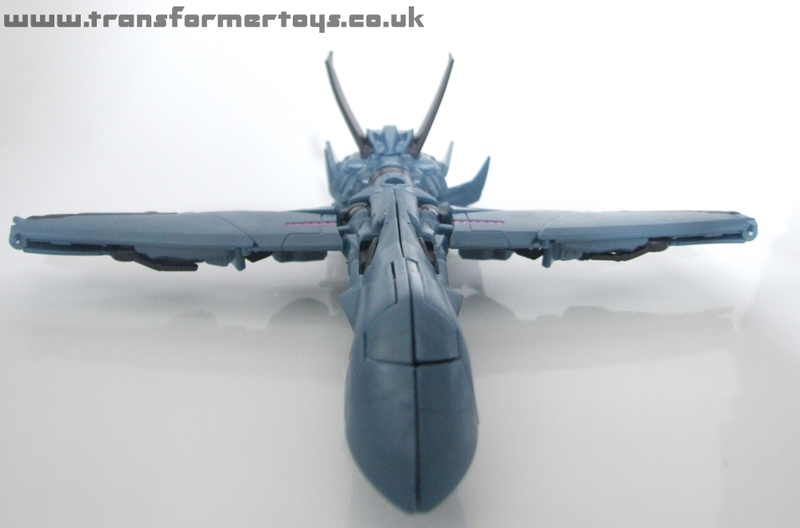 The figure comes packaged in vehicle form which is based on a high altitude spy aircraft, so slim with a large wingspan. On the whole, the figure is fairly show accurate, though the shading is probably off. 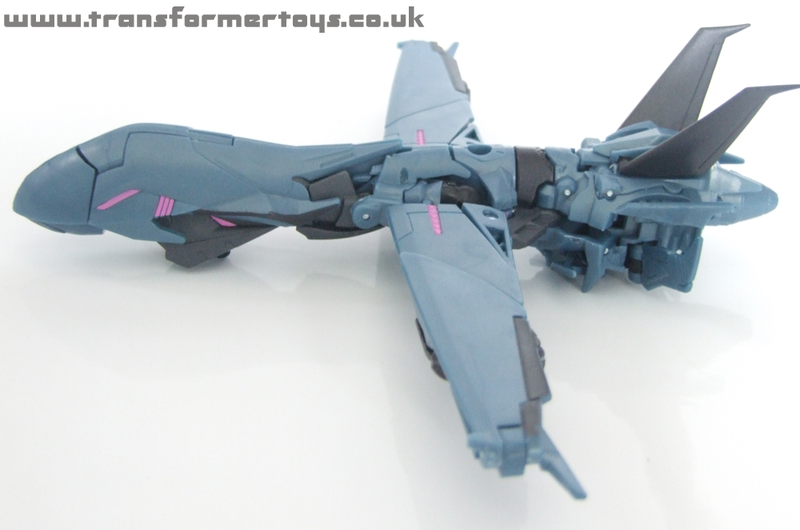 Like the other Transformers Prime releases, there is very little paint applications and the figure basically have three colour. Blue, black and pink. 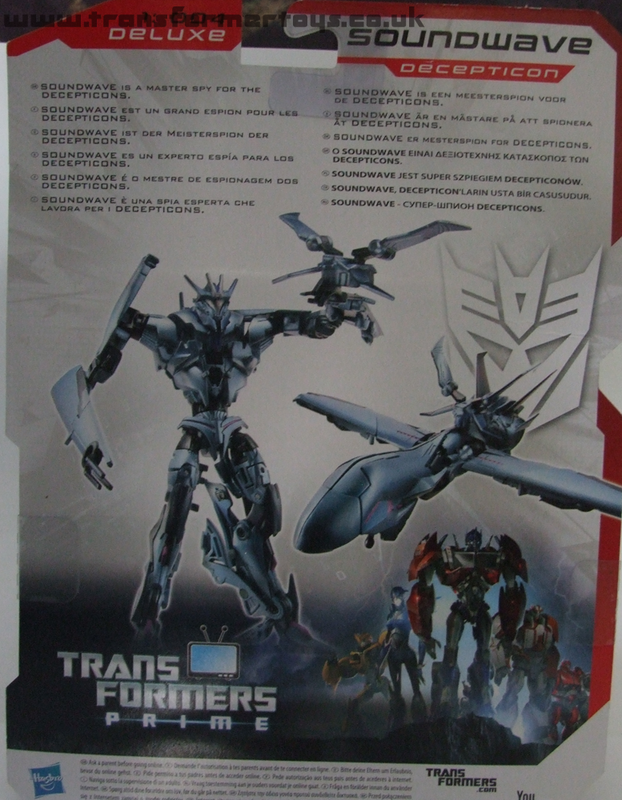 Lazerbeak, who is unnamed on the box, can clip onto Soundwave's vehicle form in two positions, ontop or underneath. His transformation is pretty simple so he'll be no problem for children, Hasbor rate the difficulty as a 2. The head of the figure is spring activated meaning that it raises up automatically during the transformation process. 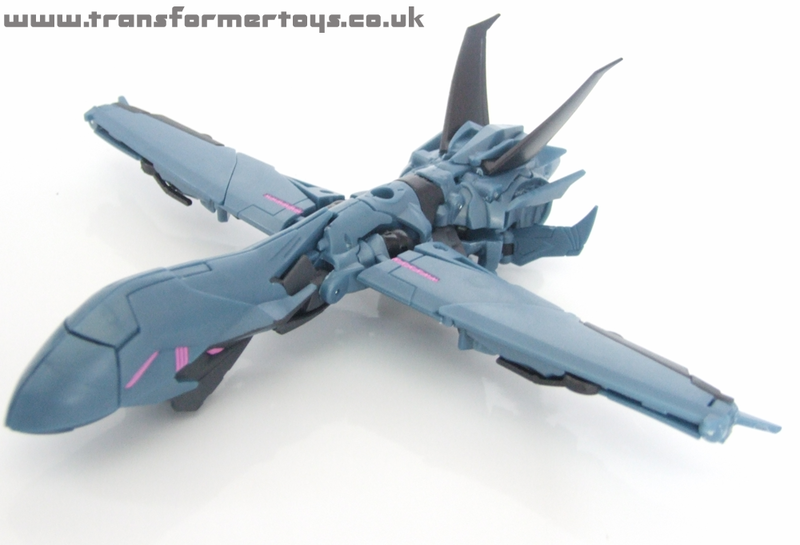 In robot mode, Lazerbeak fits snuggly onto his chest, as per the cartoon, in a homage to the Brestforce in Transformers Victory. 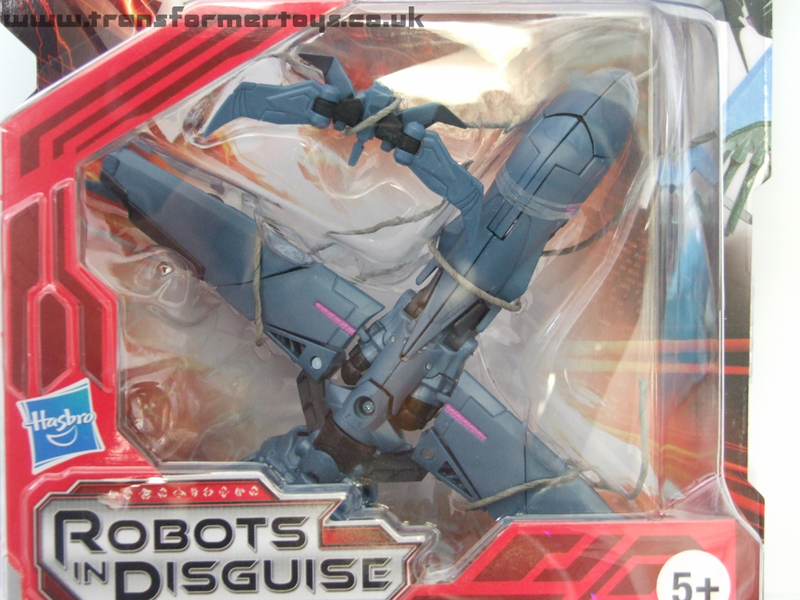 The figure looks better with Lazerbeak attached as oppose to being separate as it adds more angles to the figure. Lazerbeak can also clip onto either wrist of Soundwave allowing him to be posed as if he was reporting back to his master. 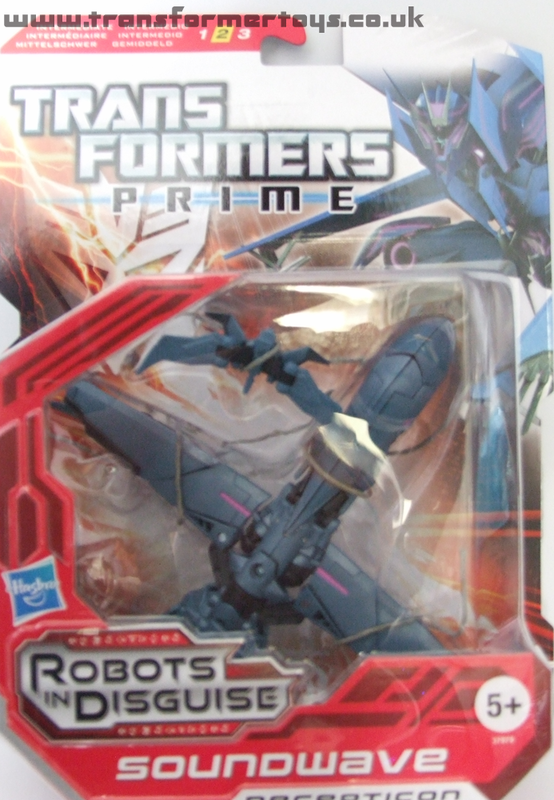 The character of Soundwave in Transformers Prime was designed to be very spindly which is mimicked well by the action figure. 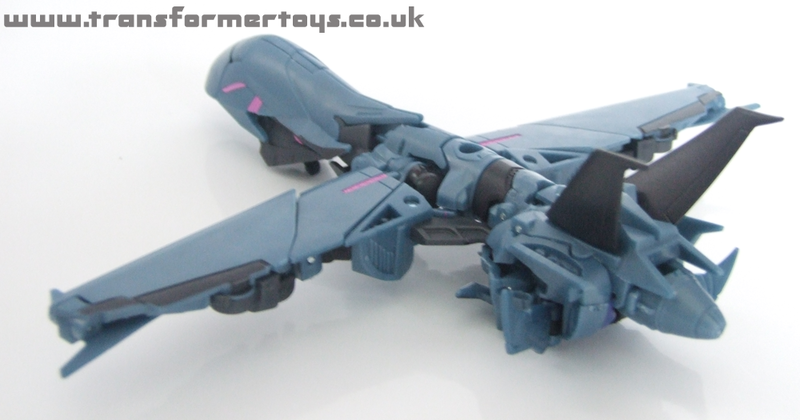 Because of this, the figure has a latter day Beast Wars / Beast Machines asthetic to him, especially with the hands, which may not be to everyones tastes. The arms are extremely well articulated, with double joints in the shoulders, elbows and a single joint halfway up the forearm. 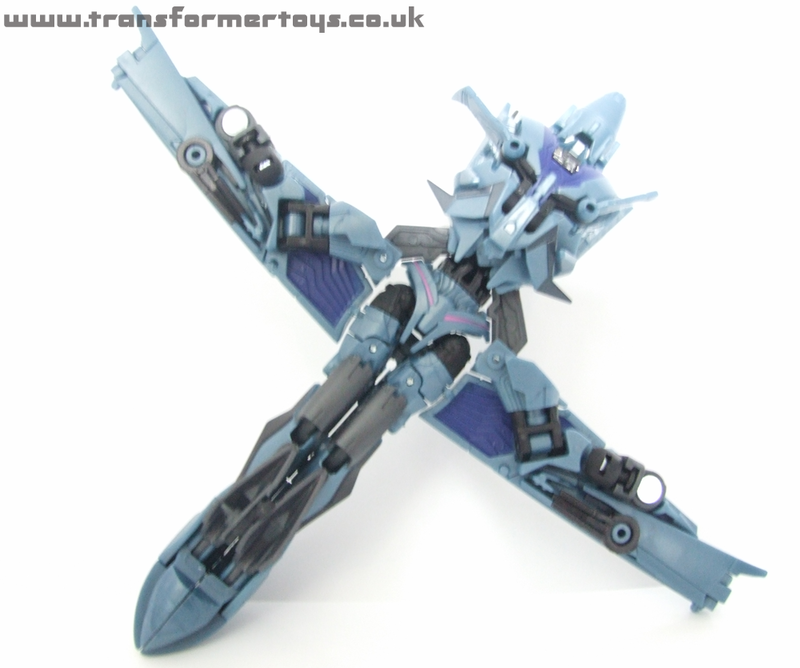 Soundwave has 360° rotation at the waist and ball and socket joints on the hips. His legs, however, are where the toy has it's flaws. There is very little movement in the knees, this is due to molding on the back of the calf hitting against the thigh. Although you can rotate his legs on the hips, the molding does get in the way if you twist his legs outwards. 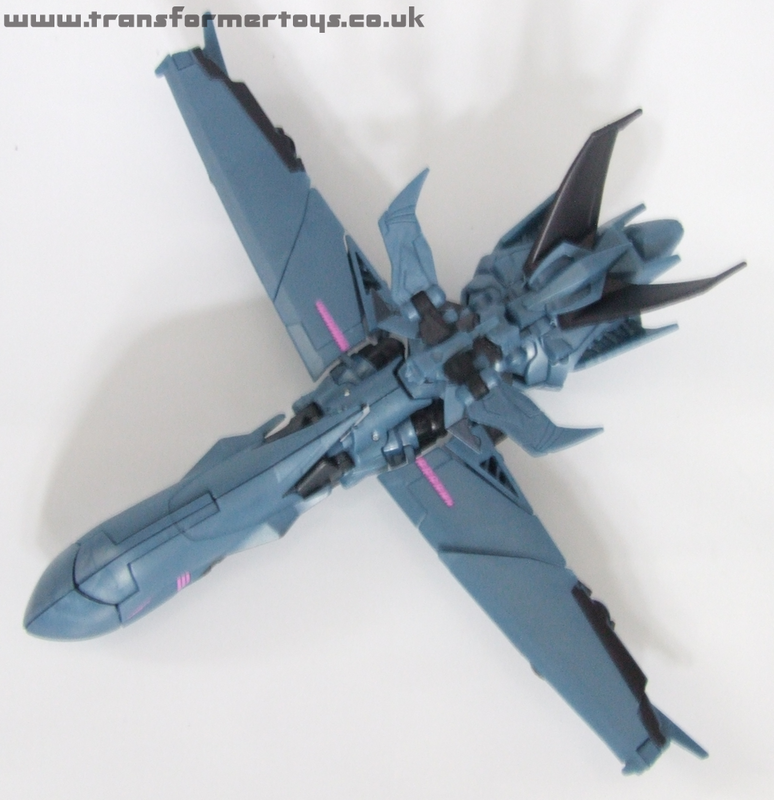 He has a slight pivot near the top of the thigh which is designed to further separate the legs in robot mode and help keep the toys legs straight. 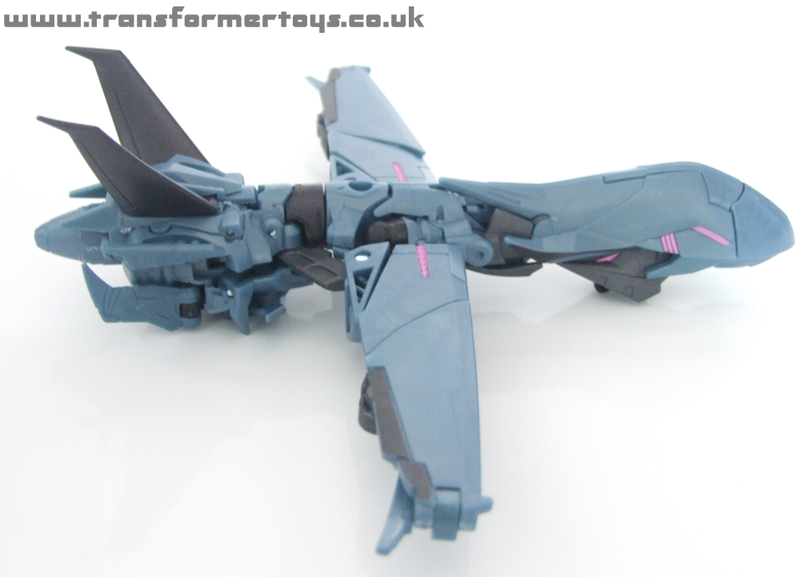 Soundwave has kneecaps and some very nice molding below that. His feet have heels to help his balance, with the right foot containing the undercarriage which is, unfortunately, molded in a different colour plastic to the rest of the foot. The nosecon of the jet, which is joined onto both legs, is designed to be popped off under stress without breaking. The figure is extremely molded extremely well on his back piece. For those of you who are interested in stamps and markings, the Hasbro copyright can be found on the lower section of the right forearm, the CE stamp is molded onto the upper section of the right forearm meaning that it does not distract from the rest of the figure as happens on many other toys these days (Thundercats anyone?). The left forearm contains the Tomy copyright with the number C-1063b. 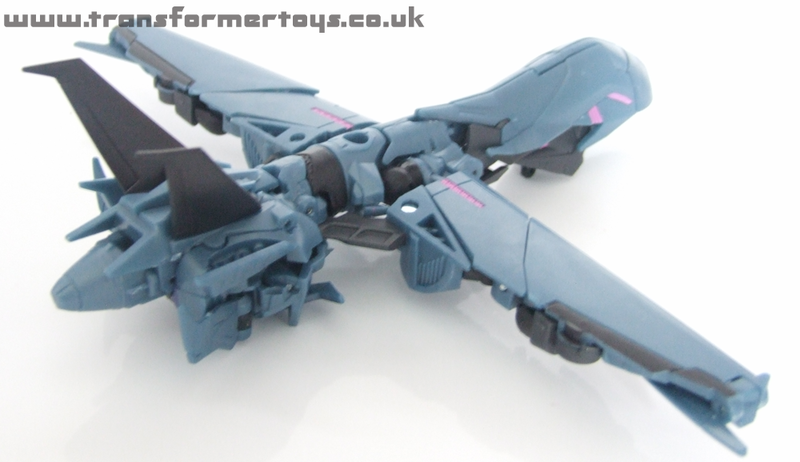 The legs have markings on them to indicate the left and right pieces on both the knees as well as the nosecon. There is also another stamp on the inside-left ankle with the number #37979. Overall, he is a really nice toy. My intial reactions are that ,of the three toys I purhcased today, he is the best. 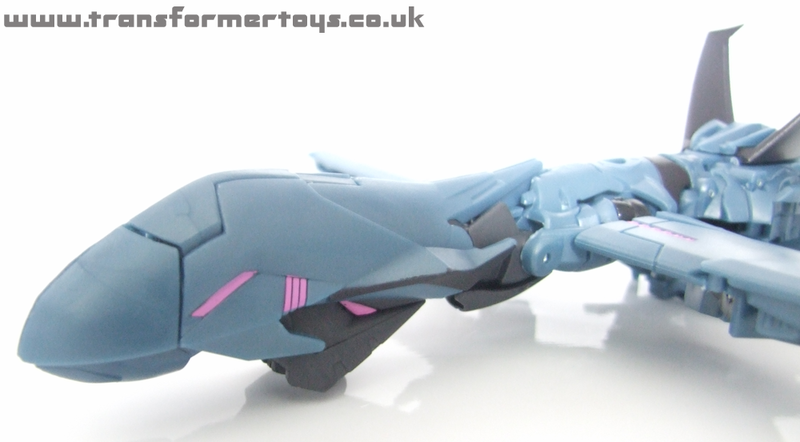 The knee joints let him down as does the lack of paint applications, but other than that he is a must have for any fan of Transformers Prime. 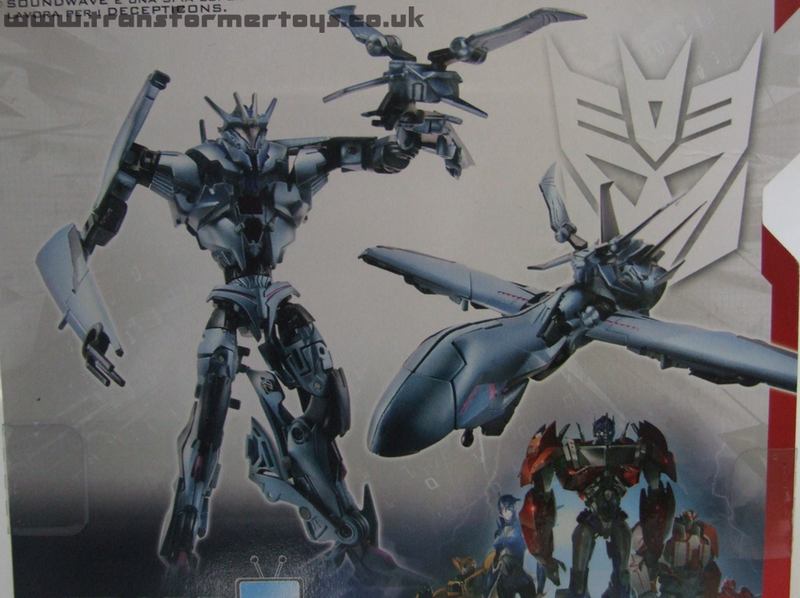 Soundwave was the first Transformers Prime toy I got out the packaging, and the fifth Transformers Prime toy that we owned (behind the New York Comic Con 2011 2-pack and Cliffjumper and Bumblebee who we also bought on the same day as Soundwave). 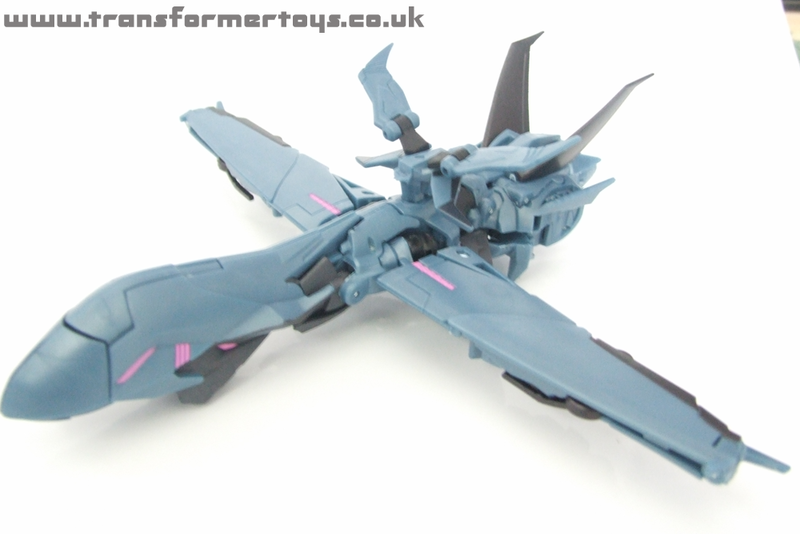 The toy is much better looking than Bumblebee, who looks really really cheap, and better than Cliffjumper who was made out by some (you know who you are) to be a great toy, but is actaully only average. Page Rendering Time: 0.2578 seconds.